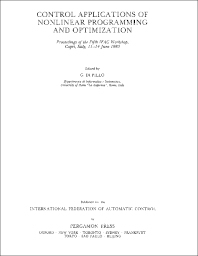 Control Applications of Nonlinear Programming and Optimization presents the proceedings of the Fifth IFAC Workshop held in Capri, Italy on June 11-14, 1985. The book covers various aspects of the optimization of control systems and of the numerical solution of optimization problems. The text also discusses specific applications concerned with the optimization of aircraft trajectories, of mineral and metallurgical processes, of wind tunnels, and of nuclear reactors. The book also considers computer-aided design of control systems. The book is useful to mathematicians, engineers, and computer engineers.